Winter despises her stepmother, and knows Levana won't approve of her feelings for her childhood friend - the handsome palace guard, Jacin. But Winter isn't as weak as Levana believes her to be and she's been undermining her stepmother's wishes for years. Together with the cyborg mechanic, Cinder, and her allies, Winter might even have the power to launch a revolution and win a war that's been raging for far too long. Can Cinder, Scarlet, Cress and Winter defeat Levana and find their happily ever afters? Oh my goodness, this is by far my most anticipated release of 2015. At long last, The Lunar Chronicles have come to a conclusion. When I got my copy of this book, a part of me was dying to find out how it all ends but another part of me was sad to see it finish. A dilemma only book lovers will appreciate, I know. Last warning: please read the first three books of this series before continuing on with this review. Although it's spoiler free for this book, it will contain details regarding the rest of the series, possibly spoiling it for you. 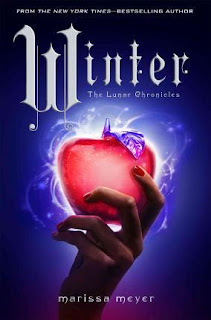 Winter by Marissa Meyer carries on from where Cress, the last book, ends. Cinder and the rest of the gang have just kidnapped Kai, who has finally learnt Cinder's true identity. They are teaming up to not only rescue Scarlet but also to bring the battle to Queen Levana's front door. Being the last book in the series, Winter has a lot of expectations to live up to. And for the most part, it delivered that. The adventure itself is stunning, full of twists and turns. It set up obstacles so that our heroes and heroines really had to fight for their quest but that just made the finale all the more bittersweet and heartfelt. Being the last couple to appear on the scene, I was afraid I will not be able to fall in love with Winter and Jacin as I had with the previous three pairings. Marissa Meyer, however, laid most of those fears to rest. There is plenty of Winter and Jacin for me to really relate to them and feel their heartache. However, amongst all the scenes of the other six protagonists (plus the antagonists), I can't help but feel they are at the bottom of my lists of Lunar couples. As far as fairy tale retellings go, Winter is very much on point. I was expecting most of the fairy tale to buried under all the action and drama but instead, Meyer took the time to bring out familiar elements of the classic fairy tale. This is definitely one of my personal highlights of the book. So despite all these greatness, why didn't I give this book a full five stars? The pacing. Standing at 800-odd pages, I really felt the full length of it at times. The book tried to encompass too much - the set up for Winter and Jacin, the strategies and planning, the hiccups along the way etc. Don't get me wrong, I loved most of it! But at the same time, the sheer volume of stuff that is happening kind of detracted a little bit from my overall enjoyment of the book. Another element that I didn't particularly enjoy is the one-dimensional portrayal of Levana. After getting to know her in Fairest, I was hoping to see a more complex and developed antagonist. Overall, I absolutely loved this book. It is such a satisfying conclusion to the series. Although there are elements of it that I didn't completely love in order to give it the full five stars, The Lunar Chronicles is still going to be one of my favourite series of 2015 if not all times. You guys should definitely jump on the bandwagon!